The following organizations provide technical assistance, capacity building, and peer knowledge exchange on grid integration topics. Targeted audiences vary and include policymakers, regulators, utilities, researchers, and the private sector. NREL partners with the U.S. Agency for International Development (USAID) to deliver clean, reliable, and affordable power in the developing world. RE Explorer provides renewable energy data, analytical tools, and technical assistance to project developers, policymakers, and other decision makers in developing countries. RE Explorer's flagship geospatial analysis tool, the RE Data Explorer, is accessible from the RE Explorer portal and available for a growing number of countries and regions. The RE Data Explorer is a free-to-use online platform that provides built-in capabilities for analysis and visualization of renewable energy potential under user-defined geographic, socio-economic, and technology scenarios. This tool provides access to data and analysis capabilities that inform key planning activities including Renewable Energy Zones, grid integration studies, and technical potential assessment, among others. The Clean Energy Solutions Center, an initiative of the Clean Energy Ministerial, facilitates deployment of renewable energy and energy efficiency technologies and services by supporting the design and adoption of effective clean energy policies and programs. In partnership with more than 35 leading clean energy organizations, the Solutions Center offers free expert assistance, resources, tools, webinars, and training forums to support clean energy policy design and implementation. An initiative of the Clean Energy Solutions Center, CEGIN provides expert assistance, training, technical resources, and knowledge exchange opportunities at the regional and global level to support high levels of renewable energy integration with the electricity grid. CEGIN was launched in partnership with 21st Century Power Partnership, Low Emission Development Strategies Global Partnership, the Asia LEDS Partnership, the U.S. Agency for International Development (USAID), and the U.S. Department of Energy's Office of Energy Efficiency and Renewable Energy's (EERE) International Team. To support clean energy regulators globally, CERI (another initiative of the Clean Energy Solutions Center) provides a knowledge resource to catalyze clean energy market transformation. 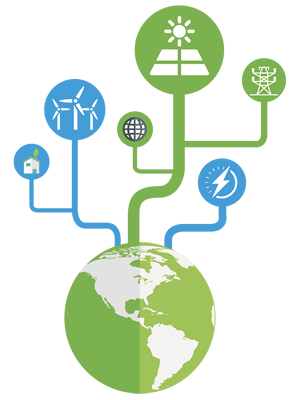 CERI provides webinars, training, expert assistance, and other technical resources to build capacity among utility regulators and other clean energy stakeholders in deploying and integrating clean energy technologies with the electricity grid. An initiative of the United States Agency for International Development (USAID), ClimateLinks is a knowledge portal that links climate change and development practitioners to USAID tools, resources, and programs across the topics of climate change adaptation, clean energy, sustainable landscapes, and integration. The ClimateLinks portal also hosts the Greening the Grid YouTube channel. A USAID-funded initiative of the United States Energy Association (USEA), the Energy Utility Partnership program supports technical exchanges between utilities in the United States and counterparts in emerging markets. As a joint initiative of the International Energy Agency and Clean Energy Ministerial, ISGAN supports peer-to-peer government collaboration to catalyze development and implementation of smart grid technologies, practices, and enabling policies. ISGAN advances smart grid efforts through support of technical collaboration, knowledge sharing and workshops, and publication of smart grid resources. The National Association of Regulatory Commissioners (NARUC) seeks to support energy regulators around the world to improve the quality and effectiveness of energy regulation through international dialogue and collaboration. Through a partnership with USAID, NARUC International Programs leverage the expertise of regulatory commissioners and staff from across the United States to help share lessons learned and help partner countries meet their energy goals. RAP is a global non-profit supporting design and development of effective power sector policies and regulations aligned with economic and environmental development goals. RAP supports knowledge diffusion through workshops and trainings, research and publications, and direct consultations and assistance to policymakers. 21CPP, an initiative of the Clean Energy Ministerial, supports power sector transformation around the world. Through 21CPP, a Public-Private Leadership Forum supports collaboration across various critical stakeholders engaged with power sector transformation. The Partnership also publishes analyses to accelerate power system innovation and diffusion of good practices, and supports global capacity building and knowledge exchange efforts.